Spina bifida is a neural tube defect. The neural tube develops in the first weeks of pregnancy and closes by the end of the first month. Spina bifida develops when the neural tube does not close properly. There are three types of spina bifida ranging from mild to severe. The mild form of the condition may go undetected unless the patient’s back is X-rayed. Race: Caucasians and Hispanics are at increased risk. Vitamin Deficiency: Folate, folic acid or vitamin B9 may protect against neural tube defects like spina bifida. Women in their reproductive years are encouraged to maintain healthy levels of folic acid intake throughout life in the case of unexpected pregnancy. Medications: Medical research has found a connection between valproic acid, a seizure medication, and increased risk of neural tube defects. Diabetes and Obesity: Women with diabetes and/or obese women are at increased risk of neural tube defects. Hyperthermia: Elevated body temperature in the weeks when the neural tube is developing may increase risk of spina bifida and other neural tube conditions. The three types of spina bifida are occulta, meningocele and myelomeningocele. Occulta is the most common form of spina bifida. Occulta: This mild form of spina bifida may not present with strong visual cues. Infants may have a small area of skin discoloration, an unusual tuft of hair or a dimple/birthmark marking the area where the neural tube defect occurred. There may be no other symptoms. Meningocele: An opening in the vertebrae allows the spinal meninges (protective covering) to bulge through. The spinal column forms as expected so surgery is used to remove the membranes. A small amount of nerve damage may be present. Myelomeningocele: Multiple gaps in the vertebrae allow the meninges and spinal cord to protrude through. In some cases the protrusion is covered by a thin layer of skin, but most of the time the nerves and tissues of the spinal cord are exposed. Nerve damage is likely and may result in weakened muscles, paralysis, bladder dysfunction, bowel dysfunction, seizures and orthopedic issues. Prenatal testing often includes a series of blood tests, including a test for spina bifida – the maternal serum alpha-fetoprotein test. 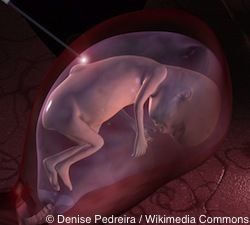 If AFP or alpha-fetoprotein levels are high the obstetrician will order an ultrasound to investigate possible cases, including neural tube defects like spina bifida. If the ultrasound shows no signs of spina bifida, an amniocentesis may be ordered to assess AFP levels in amniotic fluid. Spina bifida occulta does not typically require treatment, as most cases are not detected at birth. Meningocele cases will likely undergo surgical removal of the protruding membranes. In the case of myelomeningocele, surgery is required to replace nerves and tissue and close the gap. If the condition is recognized prior to birth, prenatal surgery may be suggested to repair the condition prior to birth. Severe cases require on-going medical treatment, which may include surgical, medicinal and therapeutic interventions. The prognosis for most children is good. With treatment and on-going care children can live long, healthy lives. Around 14 to 16 years of age, children are parents prepare to move from pediatric to adult care, which can involve coordinating care from multiple physicians, depending on symptoms. In severe cases, children and adults may require 24-hour care or support, especially if paralysis is present.